Wrap yourself up in this beautiful Summer Morning shawl. The light and lacy crochet design is perfect for cool summer evenings or crisp autumn afternoons. You can never have too many classic shawls like this in your closet. It's a timeless fashion piece that looks great on any body type. Bernat's Cotton-ish yarn by Vickie Howell is the perfect choice to use for this free crochet pattern. Thanks to AllFreeCrochet user tpmcgoo2 for helping us name this beautiful crochet design! Crochet Gauge16 sc and 18 rows = 4" [10 cm]. Finished SizeApprox 50" [127 cm] wide x 21" [53.5 cm] deep. Size 4 mm (U.S. G/6) crochet hook or size needed to obtain gauge. Beg at point, ch 12. (See diagram in Materials List). 1st row: 1 dc in 9th ch from hook. Ch 2. Miss next 2 ch. (1 dc. Ch 4. 1 tr) in last ch. Turn. 2nd row: Ch 3 (counts as dc). 8 dc in next ch-4 sp. 1 dc in next dc. Ch 2 (center). 1 dc in next dc. 8 dc in next ch-9 sp. 1 dc in 5th ch. Turn. 3rd row: Ch 4 (counts as dc and ch 1). (1 dc in next dc. Ch 1) 8 times. 1 dc in next dc. Ch 2 (center). 1 dc in next dc. (Ch 1. 1 dc in next dc) 8 times. Ch 1. 1 dc in top of ch 3. Turn. 4th row: Ch 4 (counts as dc and ch 1). (1 dc in next ch-1 sp. Ch 2) 8 times. Miss next dc and ch-1 sp. (1 dc in next dc. Ch 2) twice. Miss next ch-1 sp and dc. (1 dc in next ch-1 sp. Ch 2) 7 times. 1 dc in last ch-1 sp. Ch 1. 1 dc in 3rd ch of ch 4. Turn. 5th row: Ch 10 (counts as tr and ch 6). Miss first ch-2 sp. (1 hdc in next ch-2 sp. Ch 6. Miss next ch-2 sp) 4 times. 1 dc in next dc. Ch 2 (center). 1 dc in next dc. (Ch 6. Miss next ch-2 sp. 1 hdc in next ch-2 sp) 4 times. Ch 6. 1 tr in 3rd ch of ch 4. Turn. 6th row: Ch 3 (counts as dc). 8 dc in first ch-6 sp. (1 hdc in next ch-6 sp. Ch 6) twice. 1 hdc in next ch-6 sp. 8 dc in next ch-6 sp. 1 dc in next dc. Ch 2 (center). 1 dc in next dc. 8 dc in next ch-6 sp. (1 hdc in next ch-6 sp. Ch 6) twice. 1 hdc in next ch-6 sp. 8 dc in last ch-6 sp. 1 dc in 4th ch of ch 10. Turn. 7th row: Ch 4 (counts as dc and ch 1). (1 dc in next dc. Ch 1) 7 times. 1 dc in next dc. 1 hdc in next ch-6 sp. Ch 6. 1 hdc in next ch-6 sp. (1 dc in next dc. Ch 1) 8 times. 1 dc in next dc. Ch 2 (center). 1 dc in next dc. (Ch 1. 1 dc in next dc) 8 times. 1 hdc in next ch-6 sp. Ch 6. 1 hdc in next ch-6 sp. (1 dc in next dc. Ch 1) 8 times. 1 dc in top of ch 3. Turn. 8th row: Ch 5 (counts as dc and ch 2). (1 dcfp around next dc. Ch 2) 7 times. 1 dcfp around next dc. Ch 1. 1 hdc in next ch-6 sp. Ch 1. (1 dcfp around next dc. Ch 2) 8 times. 1 dc in next dc. Ch 2 (center). 1 dc in next dc. (Ch 2. 1 dcfp around next dc) 8 times. Ch 1. 1 hdc in next ch-6 sp. Ch 1. (1 dcfp around next dc. Ch 2) 8 times. 1 dc in 3rd ch of ch 4. Turn. 9th row: Ch 10 (count as tr and ch 6). Miss first ch-2 sp. (1 hdc in next ch-2 sp. Ch 6. Miss next ch-2 sp) 4 times. Miss next: (Ch 1. 1 hdc. Ch 1). 1 hdc in next ch-2 sp. (Ch 6. Miss next ch-2 sp. 1 hdc in next ch-2 sp) 3 times. Ch 6. 1 dc in next dc. Ch 2 (center). 1 dc in next dc. (Ch 6. Miss next ch-2 sp. 1 hdc in next ch-2 sp) 4 times. Ch 6. Miss next: (Ch 1. 1 hdc. Ch 1). (1 hdc in next ch-2 sp. Ch 6. Miss next ch-2 sp) 4 times. Ch 6. 1 tr in 3rd ch of ch 5. Turn. 10th row: Ch 3 (counts as dc). 8 dc in first ch-6 sp. *[(1 hdc in next ch-6 sp. Ch 6) twice. 1 hdc in next ch-6 sp. 8 dc in next ch-6 sp]. Rep from * once more. 1 dc in next dc. Ch 2 (center). 1 dc in next dc. **[8 dc in next ch-6 sp. (1 hdc in next ch-6 sp. Ch 6) twice. 1 hdc in next ch-6 sp]. Rep from ** once more. 8 dc in last ch-6 sp. 1 dc in 3rd ch of ch 10. Turn. 11th row: Ch 4 (counts as dc and ch 1). *[(1 dc in next dc. Ch 1) 7 times. ** 1 dc in next dc. 1 hdc in next ch-6 sp. Ch 6. 1 hdc in next ch-6 sp]. Rep from * once more, then from * to ** once. 1 dc in next dc. Ch 2 (center). 1 dc in next dc. Ch 1. Rep from * to last dc. Ch 1. 1 dc in top of ch 3. Turn. 12th row: Ch 5 (counts as dc and ch 2). *[(1 dcfp around next dc. Ch 2) 7 times. 1 dcfp around next dc. ** Ch 1. 1 hdc in next ch-6 sp. Ch 1]. Rep from * once more, then from * to ** once. (Ch 2. 1 dc in next dc) twice. Ch 2. Rep from * to last dc. Ch 2. 1 dc in 3rd ch of ch 4. Turn. 13th row: Ch 10 (counts as tr and ch 6). Miss first ch-2 sp. *[(1 hdc in next ch-2 sp. Ch 6. Miss next ch-2 sp) 4 times. Miss next: (Ch 1. 1 hdc. Ch 1). Rep from * twice more]. Ch 6. ** 1 dc in next dc. Ch 2 (center). 1 dc in next dc. Ch 6. Rep from * to **. 1 tr in 3rd ch of ch 5. Turn. Rep rows 10 to 13 for pat, noting rep in [ ] will be repeated 1 more time in subsequent rows, until Shawl measures approx 50" [127 cm] across top straight edge, ending on a 12th row of pat. Fasten off. For once I am very glad that the complete pattern for this project is shown here on AllFreeCrochet because it is NOT on the Yarnspirations site any more. I love the sunny color of the yarn, and the oversized shells look like the suns rays peeking over the horizon. Ill have to Copy and Paste this into a new document, but thats okay. This Summer Morning Shawl is so beautiful, the color used is very appropriate for the summer season. The color yellow signifies sunshine and life, perfect as mother's day gift, Christmas or birthday gift to someone special. Yellow is my favorite color, need I say more? Cheers! It's so pretty in yellow. In my opinion it looks a little tiny as pictured on the model. I'm afraid it wouldn't be enough to cover up a woman my size, plus-sized. This might be one that I would have to step up on the yarn bulk and the hook size for a little extra coverage. Otherwise, it is lovely! I could see this also in many colors. I would call it "Cover me softly with color"....I have not had time to try this one yet. Reminds me of France in May. I would call it French Breakfast Shawl. I've made several of these for friends and daughters ), very cute. I had to make one for myself and I simply adore it, the stitches are very pretty and soft. The shawl reminds me of butterfly wings, so the title could be....Like Wings of a Butterfly Shawl. What diagram ? I just copied the pattern to word and spaced out the rows so I could read it....it also says it is Spring Morning shawl and then the pattern says Summer Morning shawl. I hope the pattern matches the picture....this is a bit confusing. I just think this shawl is lovely! It looks like Woven Gold and that is what I would name it. Diagram with pattern is not the correct diagram. 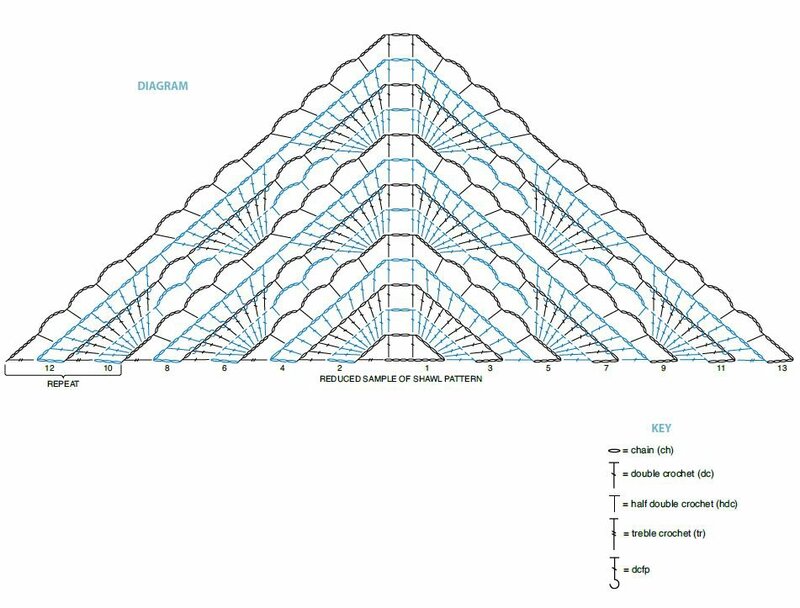 The diagram is for NO NAME SHAWL, is there any way to provide the correct diagram? Big Thanks for the creator for sharing the 'diagram' too !!! I am not from the United States or Britain or Australia with less knowledge of English than necessary, so following the written patterns is much too difficult and makes me feel uncertain in really desiring to make the piece... :( I' ve been crocheting for ages with lots of practice and have been reading this newsletter for more than a year for fun because I never found anything with the the sketch/diagram which is absolutely common to use in Europe. So for the first time, I could complete something from this fabulous webpage and tell you, having done it from raw white yarn for a holy communion mass with a simple navy blue Jackie K. style dress it REALLY looked pretty! Thank you so much and please if possible try to draw the diagram when it is possible letting us foreigners to do it too! YIKES! Has ANYONE tried making this let alone naming it? It's single spaced, making it tough to follow. I agree with the comment left by Rhonda Lefty on 6/2/13. It has been a struggle to get through, referring to previous placed stitches to see the pattern. Thankfully the center is referenced so I know I am on the other side. I have been crocheting for 30+ years and this should be rated "beginner" if the pattern was written correctly. How can I print this pattern? Love the design! Can you keep going with the rows to make it a little bit bigger or longer? Why is there no print button on this pattern? It looks pretty in the picture, but I tried the pattern and could not get it to lay right. The shell areas hang away from the chain stitch areas. I am an experienced crocheter (36 years) so I think something is wrong with the pattern. I totally agree. I, too, am an experienced crocheter and have tried this pattern about 7 - 8 times. There's something wrong as the written pattern does not line up with the chart and it won't lay flat either. All goes well until row 8. Sunday morning shawl I can wear this over my summer dress to church. I call it "Feather Touch"
3 ply or sports weight -- depending on the company of course! I think it should be named "Lemon Swirl"
Love this & making this for our local cancer center. very pretty! reminds me of "golden lace"
I think "Sweetheart Shawl" would be a good name for this shawl. The young model has such a sweet, innocent expression on her face; I bet her daddy calls her his "Little Sweetheart". This shawl could be in any color, even a color for those cool fall days and nights. Cotton Twill Delight Shawl, because it brings a smile to your face as soon as you see it!! I also like "Fan"fare Cotton Shawl. I can't put my finger on the stitch used, but it resembles an open hand-held fan. I like the names Lemon Slice, Lemon Slices, or Lemony Swirls. "Summer Sunrise" because that is what I see when I look at this lovely shawl. "Sunday at the Beach" Waves, shells, fans and rays of sun all appear in the pattern and it reminds me of when I was younger we had to wear a shawl over our shoulders in church ( no bare arms allowed). I think this should be named the Pot o' Gold Shawl, both because of its color and because it looks so RICH. Since this shawl could be any color, I go with the circle motif. The name Ajla means halo, circle of light, moonlight. I also like Mariko (This one especially), her name means circle child. Sunshine on My Shoulders Shawl. I see this shawl as "Elegance in Geometric Shapes"
I think we should think outside the sunshine box. Crochet this in a varigated brown and call it "Owl Eyes". The name is "Sunshine love Shawl"
"Dandelion Dream" because of the beautiful golden yellow. I picture wearing this while drinking my AM coffee on the deck. I think It should be named "sunshine rising"
Amarillo Lacey Shell. This name describes the shawl that is shown but even if a person was to chose a different color the name could still apply for a woman would want to wear a beautiful lacey shell shawl such as this in Amarillo, Texas especially in the spring or on a summer evening. Golden Phoenix, because the spine of the shawl looks like a phoenix, and the rest of the shells resemble the phoenix wings. Cover of Sunshine, would be my idea. This shawln looks very pretty and soft. I would call it "Sweet sunrise". I think it should be called "Golden Arches" or "Beautiful Arches"
I would call it "Lacey Sunshine"
It looks like water so " Droplet Shawl". I would do it in a blue/white combo and call it "Ocean Waves Shawl"
It should be " The Lemon Sunshine Shawl"
This shawl makes me think of Sunny Delight as a name for it. Crown shawl or Royal shawl. The patern looks like crowns to me. I saw the shawl on facebook and thought of "Lemon Fresh" and when I got on All Free Crochet, I noticed the color name in the pattern. LOL But I do love "Lemon Fresh". To me it suits it. Summer breeze shawl is very pretty, love it! Summer shawl is my thought ,this is very elegant would be perfect for Weddings in the summertime. This is beautiful. My name suggestion is Sunshine Waves. I love this pattern! How about Summer Sunshine Shawl? I think it names itself "Pure Elegance"
I would call it "Pineapple Delight"
"Ocean Waves Shawl" When I first saw this shawl it reminded me of waves gently rolling onto the shore. Of course the color didn't but the design reminded me of waves. Can not wait to make this shawl. When studying the pattern diagram I could see shells, pineapples, butterflies and more. To capture the beauty of the hidden images and open work, you could try Delicate Illusions. This is a very nice and easy shawl. I wold call it "Lacey Cluster Shawl"
Illusion wrap. Sometimes it looks like fans, sometimes like butterflies and there is just an illusion of what is underneath. MANGO DELICACY is what I'd like to call this delicate shawl. It is light, summery and looks awesome. I think that "Golden Dream" would be a great name. I would call it Sunshine. I would call it "On the Sunny Side"
"Bells and Bars" gets my vote. "Sunflower lace" might be a nice name for this summery light shawl. I think "Sunshine & Lacy Shells" would be a nice name. The Simple Shawl would be a good name..
How about "Lovely in Lace"